Did you wonder where I went? This time, nowhere, a grinch took over my blog and wouldn't let me add any pictures, and I'm not interesting enough to create a blog post with no pictures. But things are working just fine again, what a relief. 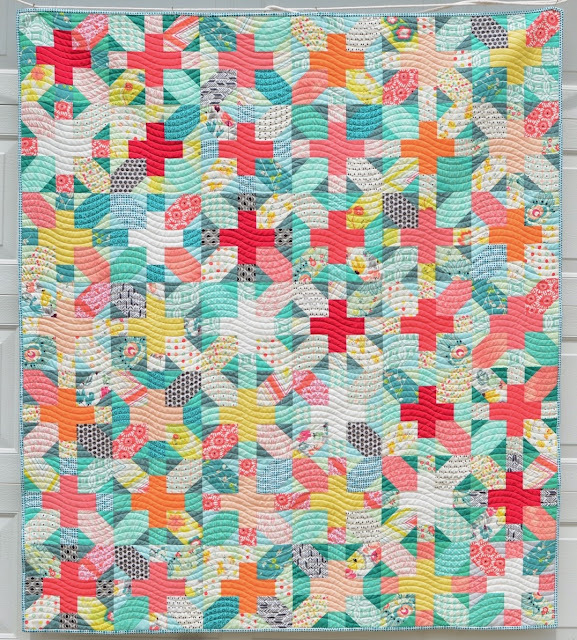 I've been a fan of the X's and +'s quilt pattern for a while. The pattern's not new, it's just taken me this long to decide on my plan of attack. If you check out Pinterest, there are hundreds of versions of this pattern, all wonderful. 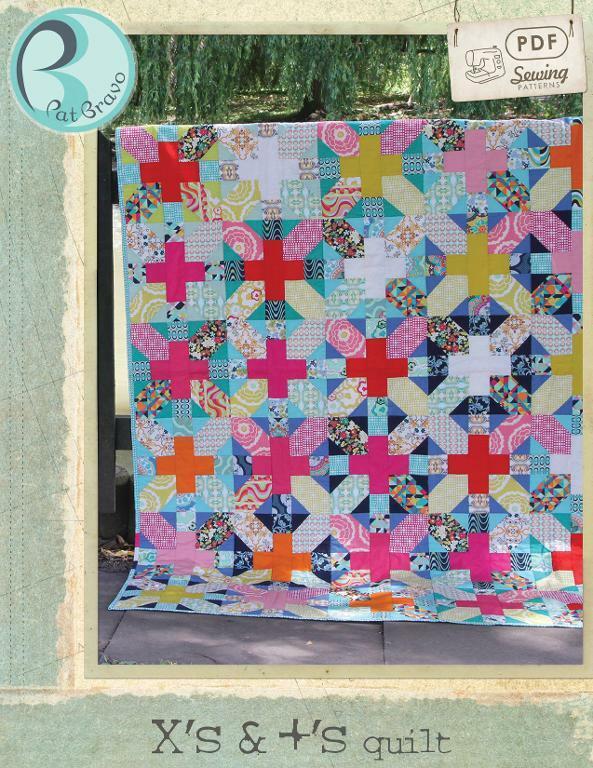 Here's a great scrappy version by Peggy at Stitchin with Peg. 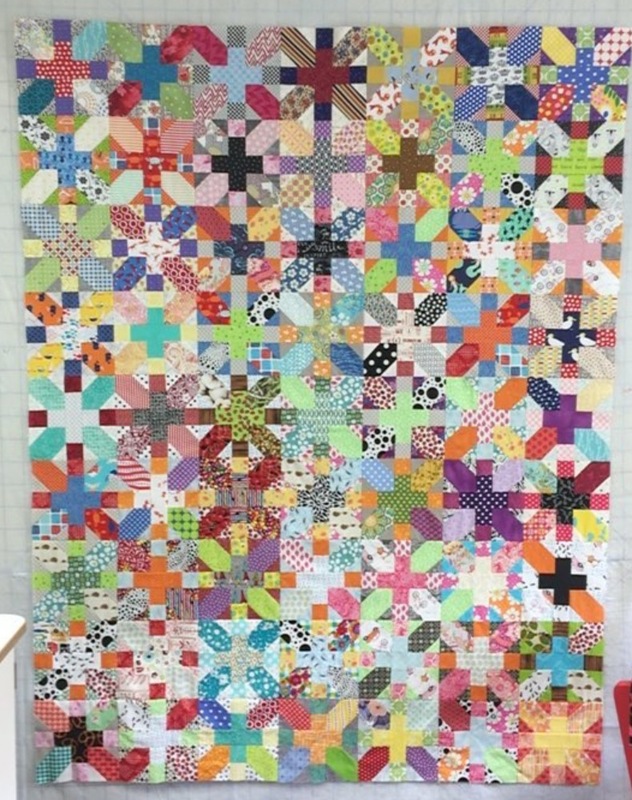 I would love to make a quilt exactly like this one, or one with different size blocks, those are great too, but it's still really hard for me to do totally scrappy, I'm still struggling with controlled scrappy. There are several versions of this pattern available, Zen Chic designed one and here's a link to a tutorial created by Bad Skirt. I'm going with Pat Bravo's pattern. My main inspiration for this quilt came from Cindy Lammon at Hyacinth Quilt Designs, who used Pat's pattern to make this version. 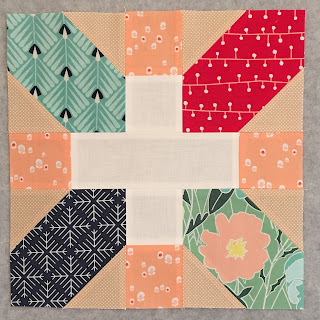 I didn't notice until Cindy pointed it out, the pattern uses the same fabric in the center plus blocks going diagonally one direction, and the same fabric for the square corners going diagonally the other direction. So while this is a very scrappy quilt, it has enough sameness going on to appeal to my sense of order. I decided to go with an assortment of Art Gallery fabric that I had collected over the last few years. Not just one family by one designer, or even several families by one designer, instead several designers and several families. 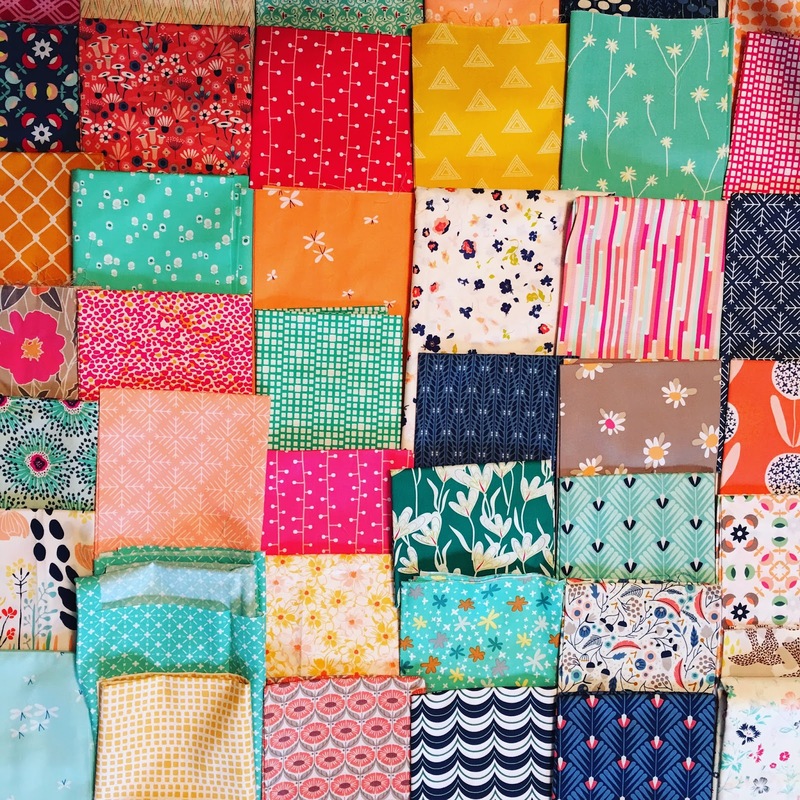 It took me two afternoons in my sewing room to put together this assortment of 42 different pieces of fabric. 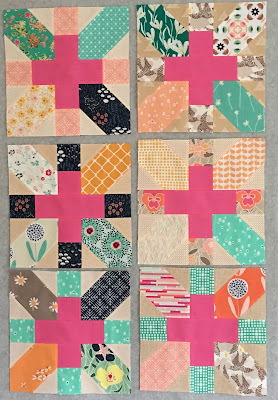 I'm spoiled by fat quarter bundles, where I customize it to my liking by adding and subtracting a few prints. But it was a good challenge, something I need to do more often. And here's my inspiration block. I was worried about the plus points matching up with the square corners, but I used my Prairie Sky Quilting Folded Corner Clipper ruler to piece the beige corners on the print blocks, and everything lined up perfectly, no fudging required. Here are my 6 blocks with a white center. 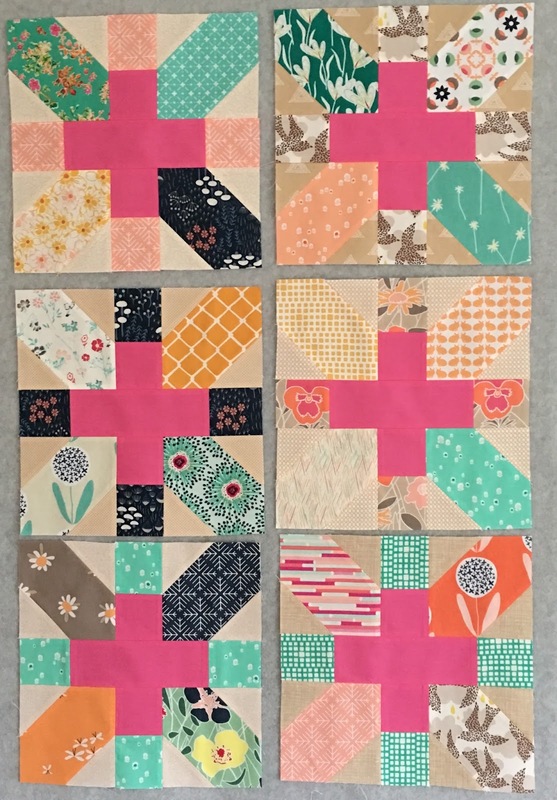 And 6 blocks with a pink center. Now I have to stop, I'm heading out of town on vacation. I usually leave town with an empty design wall, finishing my current project before I leave town, but I think it will be nice to have this project on my design wall to welcome me home. And on the topic of my vacation, I've created an Instagram account to post pictures of my trip to Italy. It's mainly for family and there will be over-gramming, particularly of food, but feel free to follow along at thelma_italiano, friends are also welcome. I'll post any quilty/crafty related pics on my regular instagram account, thelmacupcake. Have fun! Be sure to lean how to say in Italian, "Take me to the quilt shop, please"! This is really shaping up beautifully. I've loved the scrappy versions I've seen, but felt a bit overwhelmed at the idea of tackling all of that. You may have hit on a workable compromise. Enjoy your trip! I have long admired that quilt pattern. I have yet to tackle it for some of the same reasons you talk about. How to make it scrappy and yet have it be a controlled scrappy, like I prefer. Maybe someday I will get to it! 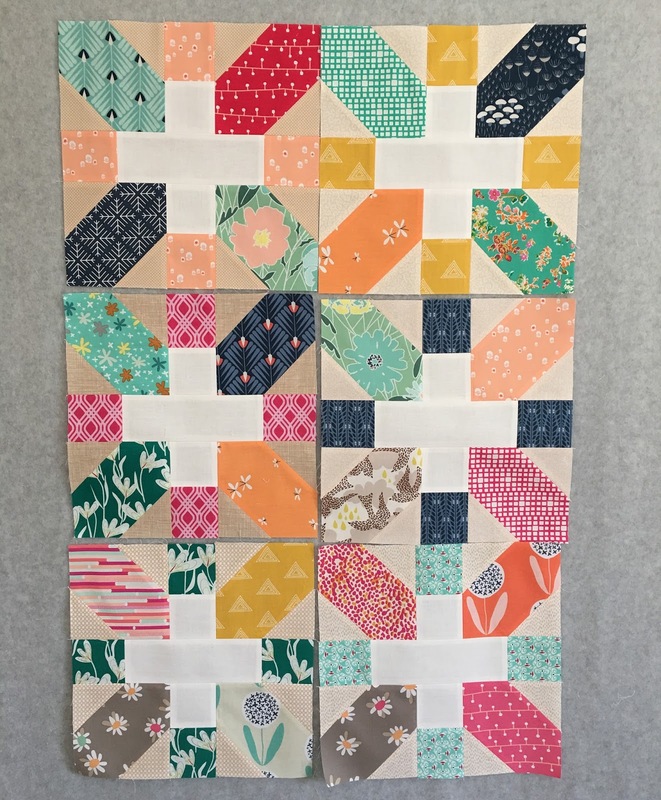 Love how you are doing this quilt...I get lost in "too scrappy" quilts, your sense of order makes the scrappy just right! Enjoy your trip! 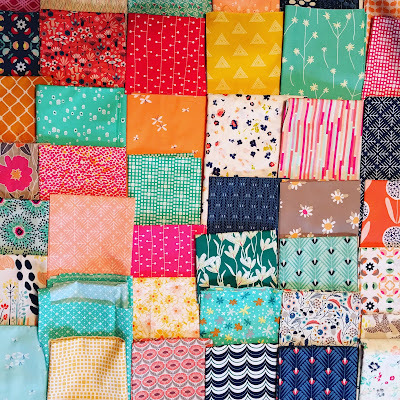 Love your blocks and the colors and fabrics you use! Have a fun time in Italy! I'm a big fan of this block also! I remember Cindy's quilt... great colors. 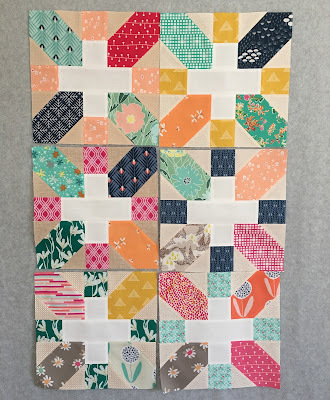 I think it will be fun with a stylized assortment of fabrics... and now that you have the colors worked out... it should almost put itself together while you're on vacation! (okay, not really but it will be marinating) Have a greeat trip! I made one of these and straight line quilted it. I REALLY like the wavy lines quilted on this one. I may need to do another this way. These are some lovely blocks. I did an X and + quilt a few years ago, in blues, greens and greys. I really love it, and want to do a totally scrappy one. The solid + is a great idea. I really do love this pattern...there are so many terrific variations to play with! Have a blast with the quilt and on your vacation! I've made that quilt and it looks more like Cindy's and I love it, but your seems to have a low volume thing going (maybe all those white crosses). It's looking great! Your blocks are looking very pretty! Enjoy your trip!